Click on the team name to see more game info or on Tickets to purchase tickets for the game. Looks like the mighty 12th Man can’t sell out their biggest game of the year against a team they claim is their rival. Texas A&M’s 12th Man Foundation didn’t sell their entire allotment of tickets to Aggies and have opened up ticket sales to the general public. Head over to their site and buy as many as you can afford and paint Kyle Field burnt orange. Or if you want to choose your own seats check out what’s available on StubHub . The Longhorns will play another primetime, national TV game next Saturday. The television and time of Texas’ game versus [tag]Kansas[/tag] has been announced as a 7pm kickoff on ABC. The Jayhawks, with a 1-5 conference record, aren’t exactly a marquee team this season but it’s slim pickings for the networks as there are no games featuring two ranked opponents this week. Longhorn fans, particularly season ticket holders, got some exciting news this week when The University of Texas announced Friday that two big opponents had been added to the future schedule. Texas will take on a pair of BCS non-conference opponents in 2015 and 2016. A home and home football series with Pac-10 foe [tag]California[/tag] and Big Ten opponent [tag]Minnesota[/tag] has been scheduled for the 2015 and 2016 seasons, The University of Texas announced Friday. The Longhorns will travel to Minneapolis on Sept. 19, 2015 and to Berkley on Sept. 10, 2016. The Bears will visit Austin on Sept. 12, 2015 and the Gophers will return to Austin on Sept. 17, 2016. Great job by the Texas athletic department to schedule top quality BCS opponents. Add those games to [tag]UCLA[/tag] in 2010 and 2011 and [tag]Ole Miss[/tag] in 2012 and 2013 and you’ve got some winnable, marquee games against big name programs. Should be fun to watch. 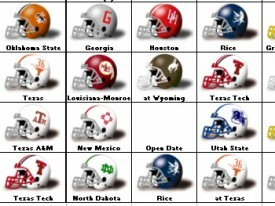 Thankfully once again someone has put in the time and effort this year to come up with the 2009 NCAA football helmet schedule. Not sure what I would do without it. Thank you anonymous time waster! Just like in previous years, each conference is broken down into different tabs, with each tab containing the teams schedule in a fixed matrix style. This year’s schedule adds a different twist, using old school helmets for each team. Pretty cool indeed. The Longhorns first two games of the 2009 season aren’t exactly against marquee competition and the TV listings show it. It could be about to get worse. The Horns’ September 12th game against [tag]Wyoming[/tag] is currently slated to be on Versus, but negotiations between the TV network and DirecTV may cost many Texas fans the opportunity to the see the game. If an agreement can’t be reached by August 31st, DirectTV subscribers will no longer be able to view the network. Even worse for fans, the usual way to see a sports game you can’t watch at home is to head to your local sports bar. Unfortunately, most sports bars and restaurants are also DirecTV customers and also won’t have the game. It may be time to start looking through your Facebook friends for Dish Network customers.